Rabies can adversely affect you and your pet. Here’s how to prevent rabies and manage it, if it occurs. Rabies, one of the oldest recognised diseases, is a highly fatal viral infection of the central nervous system, which occurs in warm blooded animals. This disease causes inflammation of the brain leading to death. The rabies is transmitted by the bites of affected animals. In India, dogs are mainly responsible for maintaining the disease and transmitting it to human beings. Jackals, foxes and wolves, etc maintain the disease in sylvatic areas. Mongoose also suffers from the disease and can transmit it. Rabies is not transmitted to pups through mother. There are higher chance of transmission through their mother lick and bites. These may be described in three phases – the prodromal, the excitative and the paralytic form. Predominant excitative phase in usually termed as ‘furious rabies’ and predominantly paralytic as ‘dumb rabies’. Prodromal phase: During this phase, there is a change in the temperament of the dog, who might turn aggressive and snappy. The dog usually refuses to take food, there may be slight rise in temperature, dilatation of the pupil and sluggish corneal reflex. Excitation phase: After 2-3 days, the dog becomes increasingly irritable and restless; photophobia may be become apparent. He will not take food but will show a tendency to eat unnatural things like soil, straw, stone, wood etc. At this stage, he develops biting tendency and bites anyone coming in his way. Eyes become fixed and staring and appear expressionless. Paralytic symptoms appear in the form of dropped lower jaw, tongue hanging out, excessive salivation, change in voice and loss of voice. Paralytic stage: In this stage, the dog hides in the dark place, like under the furniture. In most cases, there is characteristic changes in his bark due to laryngeal paralysis and then to pharyngeal spasm and paralysis, causing the animal to drool saliva. Paralysis of the whole body occurs followed by coma and death. The whole clinical course of the disease may last upto a maximum of 10 days. One should be alert in certain cardinal signs, especially jaw paralysis and the typical bark. The period of incubation is roughly 10 days to one year and it depends on several factors including the site through which the virus enters into the body. If the site is closer to the brain, the disease spreads faster, resulting to death within five to seven days. Clinical diagnosis: The diagnosis of rabies is one of the most difficult and important duties that veterinarian is called upon to perform. In most of the cases, the probability of human exposure, failure to recognise the disease may place human life in jeopardy. 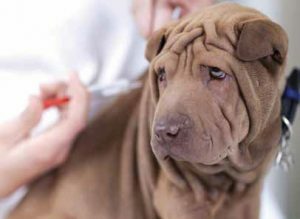 History of dog bite, sometimes prior to the development of disease, is usually most important for diagnosis. All dogs and cats should be vaccinated against rabies at three months of age and revaccinated one year later. There are two types of vaccines in use: Nerve tissue vaccines and Tissue Culture vaccines. A healthy dog, who bites a person, should be confined and observed for 10 days. It is recommended that rabies vaccine not be administered during the observation period. Such animals should be evaluated by veterinarian at the first sign of illness during confinement. Any illness in the animal should be reported immediately to the local health department. Flush and clean the bite wound with plenty of soap and water to remove and kill the virus as much as possible. After cleaning with soap solution, the wound should be treated by applying diluted solution of cetavlon. Strong corrosives like carbolic acid, silver nitrate and nitric acid are not preferred now-a-days. Do not put sutures to the wound as far as possible. In case suturing is unavoidable, use antirabies immunoglobuline locally. Do not cover the wound with plaster or sealing bandage. Antibiotics and prophylaxis for tetanus should be advocated as per the merit of case. Immunosuppressing agent like corticosteroids should not be given during the immunization period. Immediately follow the post exposure antirabies vaccination schedule. Previously immunized human will receive vaccine as per schedule. (Dr Ashwini Kumar Singh and Dr Kumar Manglam Yadav are students of Mahatma Gandhi Veterinary College, Bharatpur, Rajasthan). Towards a perfectly safe Diwali! Meal Charts to be Avoided!